The Szabadok are an Ailor cultural oddity both in their behavior and history. Theirs is a culture both universally feared and reviled by all other Ailor cultures as crude and godless horse-born invaders, pillaging and raiding the Regalian Archipelago in a tradition they call the Igaz Háború, or the War of Justice. 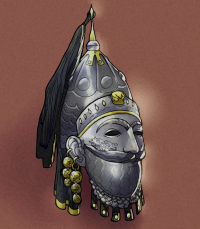 Born from the original natives of the easternmost islands off the coast of Etosil, the Szabadok are a small people with a large reputation and can often be seen in the private noble armies of numerous south Regalian nobles, particularly used in the petty fief wars between the South Dukes near Vultaro. The Szabadok are nomads, raiders, pillagers, but above all, mercenaries. They value coin highly and, unlike some of the more commonly trusted mercenary bands, are easily swayed. They have no love for their employer when a bigger investor throws more wealth at them. They see pillaging the world as their way to right the wrongs done to them by the Regalian Empire over the centuries. In the present day, the Szabadok live in an uneasy peace with the Empire as foreign yet semi-citizen, integrated into the Empire yet still very staunchly independent and treated as outsiders by virtually everyone. Little is known of the Szabadok’s early history, and it could even be said their original culture has nearly been completely wiped out. The Szabadok descend from the natives that lived on eastern islands off the coastline of Etosil, predating the Daendroque and Regalian penal colonists. Their exact role in Etosian history is often one of a footnote. Occasionally a gang-lord would invade their lands and steal their wealth and food and they would sometimes retaliate by attacking mainland settlements. They never were a very warlike race until the Regalian Empire attacked Etosil. Because of their relatively backward and tribalistic existence back then, the Empire saw no real value in them and utterly repressed their presence and their culture. Even the Etosian Patriarch saw these pagans as foreign invaders, even though they were the original natives of Etosil long before the Schism and the Daen colonists. The Szabadok started rapidly militarizing as a response to the increased repression from the Regalians. It was also ironically the Regalians who introduced horses to the Etosian islands and fostered the connection between the Szabadok and their horses. It turned out that the fertile plains of the eastern islands were very suitable for horse breeding in Etosil. Furthermore, no undead were present on the eastern islands, which is why the Szabadok could develop in relative (yet repressed) peace for the next few hundred years. Military resistance only truly occured around 250 and 260 AC, during which Regalia was just barely able to suppress the uprisings by blockading the islands. It was here that the Szabadok realized their main weakness: their inability to maneuver to different lands or support their supply lines with proper logistics. How the Szabadok managed to achieve their flight from Etosil is unclear, because thousands of Szabadok and their horses and families somehow made their way to the Regalian Archipelago without ever being detected by the Regalian war fleets. Some of the Szabadok people say that it was a divine intervention, but because of their religious freedoms it is hard to track which deity was supposedly responsible for the move. A more likely explanation is bribery of Regalian officials, as the Regalian Pessimism was beginning at this time and the corruption of the government was already weakening the Empire. Thus around 260 the Szabadok invaded the landmass of Bythalost, the South Dukelands, which would later become the home of the Etosian and Vladno migrants. Originally this landmass was mostly inhabited by smaller Alt-Regalian lords who maintained relative autonomy from the capital. This invasion occurred during the Regalian Pessimism, an era of unprecedented Regalian lethargy and military weakness. The Szabadok immediately set to work pillaging and slaughtering the local population of Bythalost, moving their nomadic horde around the countryside and burning down town after town. Bythalost did not have an official army back then or even Barons with forces large enough to hold out against a Szabadok siege (which was, despite their lack of siege engines, quite efficient). Their horse archery was unmatched by Ailor archers at the time, and even Calemberg Uhlans had trouble facing the horsemen in the field. It was by Emperor Justinian II’s decree in 283 that the raiding finally stopped after some waves of Etosian immigrants called for more peaceful relations with the locals. While the Szabadok had no love for the Etosians, they considered them a sort of brother-race oppressed by Regalians and thus chose to be more peaceful towards them (though attacks still occurred). The Szabadok then sent emissaries to the Emperor with no real actual intention to make peace. They were originally sent to just insult the Emperor and challenge his army to the open field, but were surprised by the Emperor’s charm offensive and his generous terms. Thus, the open war between the Empire and the Szabadok people ended in 284 AC with the signing of the Southland Treaty, which informally made the Szabadok part of the Empire but allowed them to remain quasi-autonomous within its borders. The Szabadok speak a language called the réginyelv (equivalent to Hungarian) or “old language” in their tongue. It is generally assumed that this language predated the actual formation of the Szabadok people because of how alien it sounds in comparison to all other Ailor languages. How this language managed to develop so independently from all other AIlor languages is unknown, but Scholars who have attempted to learn the language and compare it to earlier phases have concluded that, as time goes by, the language will continue to diverge further away from the ancestral Ceardian forms. The Szabadok are not a very varied people. All of them belong to the same city-state, and as such there are no dialects within their people. It is estimated that in total no more than 220,000 Szabadok exist in the South Dukelands, but no official census has ever been made to clarify this number. The Szabadok have a habit of adopting names from foreign cultures and making them their own. For example, the foreign name Susan becomes Zsuska while Agatha becomes Agotha. Some names like Albert or Alexa can be translated immediately without any alterations, but old names like Andor, Bodi, Boldizsar, Béla, Ibolya or Marton also exist. Generally, the Szabadok don’t ever use surnames. The Szabadok all belong to the same city-state nation, but families are usually divided between specific Lords. The Lords represent specific banners inside the Szabadok army and are each represented by an animal like a horse or a falcon or a snake. A son who is born Tabor belonging to the banner of the Snake might as such be called Tabor A Kígyófi. Hundreds of bands exist, ranging from five individuals all the way up to three hundred. They usually have their own inheretied traditions and history recorded on their banner tapestry. The Szabadok people are not ever allowed to wear platemail armor, but are at all times permitted to wear a chainmail surcoat that extends to the elbows and down to the knees. When the Szabadok wear such a chainmail surcoat, they must wear the band of the horse (a beige/yellow cloth band with the symbol of a horse in brown on it) on their right arm. The Szabadok are exempt from any laws dealing with identity obfuscation as long as they wear their traditional face masks. Traditional face masks are always unique, as they are a recreation of their own facial features in metal. While wearing such a mask, the Szabadok may not be arrested for concealing their identity or told to remove their face mask. The Szabadok are allowed full religious freedom, so long as they never speak of their religion to anyone but their own, in private, and without the presence of any non-Szabadok individuals. The Szabadok may even profess to faiths that are barred as heresy by the Regalian Empire. The sole exception to this rule is Void Worship, followers of which the Szabadok must deliver to the Inquisition if discovered amongst their brethren. The Szabadok have extended families, sometimes including multiple wives (though this is not always guaranteed). The Szabadok often capture women from villages and towns that they raid for personal gratification. Half the women seized from other areas however end up becoming the wives of the Szabadok. Despite their rather ravenous behavior towards non-Szabadok populations, they are exceptionally well-spoken and well-meaning to any slaves or captured subjects. Often it is the women they have stolen from their homelands who eventually fall in love with their masculine and kind captors, even if years before they cut their brothers and fathers limb from limb. This is due as much resignation to the fact that they will likely not ever escape, as much as it is that their situation could be far worse - Szabadok are not known to be kind to disobedient wives. Szabadok are said to be put on a horse to familiarize themselves with itat the age of two years old. Any child that shows excessive fear of horses is left to sleep with the horses to conquer it, or ousted from the family as a failure. Childhood among the Szabadok is hard, and this often leads to strong (albeit cruel) members of their society. The Szabadok have a strict gender separation policy which observes the age-old tradition of male warriors and female house-tenders. Women are sometimes however also conscripted in the army in case they have no children to take care of, or if the Szabadok feel the need for more arrows to darken the skies. Szabadok women are excellent archers and frequently train alongside their men in both horse riding and archery. Women are almost exclusively the trainers and teachers of the Szabadok people, even for the craft of combat and swordsmanship, as the Szabadok generally perceive the activities of a docile stay at home husband to be disgraceful and weak. The Szabadok are a culture that is surprisingly acceptant of other races (within limits) and of child-theft, as long as it occurs within the boundaries of their own culture. A Szabadok may for example encounter a brave or strong child during a raid and choose to adopt the child into their family unit to raise it as a Szabadok, even if they have no blood ties to them, as long as it is young enough. This occurs sometimes even with non-Ailor like Half-Orcs or Avanthar, though far less with the frailer races like Cielothar and Isldar, and practically not at all with the Allar and Maraya. Szabadok have a very loose and pragmatic view of parenthood, believing that those who raise a child are its parents, not those who simply give birth. This also means that Szabadok never lack a parent. Orphaned children of Szabadok parents are adopted by other families, and widows of fallen warriors often marry into existing families (even if the mother is not in love with the man and never shares a bed with him) just to give the children a father figure. These parental pragmatic sham marriages are far more common than one might think, purely because battlefield casualties are fairly common among the Szabadok. That being said, divorce is also very well regulated an easily achieved in a marriage, so marital problems are practically nonexistent among their people. The Szabadok don’t have a formal religion. Whatever religion the natives of eastern Etosil had died out a long time ago. As such, nearly half the Szabadok are Etosian Unionist, but these religious divisions among their people are more pronounced than in any other race or culture. This is because the Szabadok practice true and absolute religious freedom. Within their culture and in their city state, any and all religions are allowed (as long as they respect the Southland Laws), and every Szabadok is allowed to follow whatever faith they like. This sometimes results in sons and daughters having different religions than even their parents who might themselves have different religions from one another. This religious indifference is largely based on the Szabadok view of spirituality, where they see religion not as one truthful absolute, but more like a variety of the same principle applied to the Spiritual needs of the individual. While many outsiders would suspect the Szabadok do not have art, this is quite the opposite of reality. The Szabadok are the world’s most renown armor decorators. A Szabadok warrior will often go through life owning a very small number of armor sets and he will take great care of any individual set for several years. Special craftsmen among them use carving and smithing techniques to embellish and engrave beautiful shapes and decorations onto their helmets and cuirasses. Szabadok helmets are especially famous because of their unique design. While most Regalian helmets are purely functional, Szabadok helmets are designed to be a metalic representation of the wearer. No Szabadok will ever wear the helmet of another because they are always designed to fit their face in a snug manner, while also being a hyper realistic representation of what their face actually looks like, including facial hair, which is very important to the Szabadok. Another art they engage in is wool braiding, where they use threads of colored goat wool to produce colorful strings of thick braids that are spun around their house yurts and used during decorative marches on their animals. Inside of their yurts, the Szabadok use woven mats and carpets usually depicting horses or symbols of their faith, the cloth of which itself is often richly embroidered. Szabadok music is almost exclusively vocal and drums. They use drums only to provide the very basest of rhythm and prefer to use their own voices to produce music. The women sing with a loud voice that fluctuates rapidly between tones in a manner often described as “funerary wailing” by outsiders. The men use a guttural, dual-tonal method of throat singing or chanting in rhythm with the drums, usually singing praises of battle and the strength and beauty of their animals. The Szabadok armies and warriors frequently howl or chant battle cries in their dual-tone throat singing, which in itself is a method of intimidation during battle. These voices are described as demonic and evil by those unused to them, and can sometimes be considered an acquired taste by those who have grown an appreciation for the unique sound. Szabadok clothing, bar the use of chainmail and their face-mask helmet, is simple yet colorful. Their women in particular wear colored layered dresses and braid their dark hair with vibrant ribbons. Their dressing style is often described as modest, as any part that isn’t their neck is covered in cloth - even their hands which are covered with gloves - and sometimes even their neck with a fur lining. Their head is sometimes also covered with a triangular shaped hat, which angles up from the front and accentuates a bun-wrapping of hair in the back at a higher level. Men usually wear very simple pants with a knee-low skirt. Their wrists are bound with a leather strip, while the whole ensemble is kept in place with a leather belt. Their boots are usually of either sheep skin or cow leather, but they are always designed to curl upwards and inwards to a point at the front and sometimes even a bell at the end. Etosian fashion is not uncommon among the Szabadok. However, the idea of being able to swap from leisurely clothing toone’s armor very quickly is a must for the Szabadok, which explains their simplistic clothing. In terms of personal grooming, the Szabadok women usually either tie up their hair in symmetrical side-braids that flows down their shoulders, or knot up their hair in the back with pins. The female hairstyles are notably less complicated and elaborate than the men, which is why Szabadok men sometimes get accused of being vain or too self-styled. Szabadok facial hair, in particular, follows strict rules observed by nearly all members of their culture. Most Szabadok have skin tones ranging from light to tanned. Their hair tones are darker, where black is very common though dark brown is also present. All Szabadok without exception have a mighty moustache, though this is still often much thinner and wider than the more common Alt-Regalian thick variety. Szabadok men believe that a moustache is the sign of Szabadok manhood and that a moustache at least as wide as their face must always be present. It is sometimes styled up with goat fat to stay in style. Beards are also well groomed, but not always present. Their beards tend to be more curly and unruly, but become long and almost oval shaped when neatly trimmed. Szabadok architecture is practically nonexistent. Even their capital of Szülőföld is a massive tent-city with numerous yurts surrounding a great, ever-bustling market at the center. The Szabadok do however produce practical and surprisingly beautiful yurt tents in which they live. These tents are often no larger than 30 by 30 feet, or even smaller ones confined to 20 by 20 feet. Whole families reside inside these tents which are covered in well woven cloth, supported with animal furs for additional leathered protection against the weather. A hole is present at the top of the tent which acts both as ventilation and a port allowing cooking fumes to escape. Yurts can be broken down in nearly a day, allowing a Szabadok settlement to displace itself in a matter of days instead of years. Szabadok sports are almost entirely horse related, as one would expect. The most common form of Szabadok is the Kecskefuttatás where a freshly severed goat’s head is used as a ball. The sport can be compared to polo, where men hit a ball with an elongated hammer, but instead of an elongated hammer the Szabadok capture the goat’s head with a large hook that is attached to their arm. The point is then to capture said goat’s head by taking it all the way to a pole with colorful ribbons that flutter in the wind. The first person to hit the pole with the goat’s head wins the game. This game is often described as very violent, because there are no clear rules bar from not murdering one’s opponent. Horse killing is very frequent with the sharp hooks, and many riders fall from their horses and break multiple bones. These games are chaotic and often feature hundreds of riders chasing after a single goat’s head. Other sports include horse riding, racing, horse archery, standing archery, fire dancing (a dance including a fire-lit hay bale in the shape of a circle) and, surprisingly, swimming. The Szabadok are generally very fit individuals because most of their lives involve heavy physical activities, though many also suffer from arthritis or bad hips due to a lifetime spent on horseback. Szabadok are a major consumers of Opium. It is often said that the Szabadok will be the last bastion of Anahera Opium sales to fall should Opium ever be outlawed. Many of their tents reek of the smells of opiates that are traded into their markets en-masse by outsiders. This trade exists not only because of the Szabadok's love for opiates, but also as a calculated move by outsiders to essentially pacify the Szabadok population by enslaving them to the numbing opium. After all, a Szabadok who is flat on his back and completely drugged is incapable of burning the neighboring village down to the ground and slaughtering the peasants. Opium usage has become so consistent among the Szabadok that it could almost be said that their culture is one of substance abuse, and drug addiction is a serious problem among even their elite and upper class. Other forms of leisure are usually always horse related, ranging from horse hair braiding to horse beauty competitions. A surprising leisurely pastime of the war-loving Szabadok is collecting flowers and composing bouquets or flower displays. These flower displays have strict cultural and sometimes even spiritual rules regarding their composition and color usage. Because of the prevalence of even men searching for rare flowers to compose bouquets of, it is said that the Szabadok are the single largest flower-consuming Ailor culture, using all these flowers to shower their loved ones with artistic representations built of flowers plucked from nature. The Szabadok diet almost solely consists of cattle meat and goat milk-based products. Perhaps strangely, grass is also frequently used in their dishes; even though they cannot digest the grass of the Southlands, they love the taste. Szabadok archers are usually considered the polar opposites of Anglian Longbowmen. The Szabadok shoot fast, using massive low-precision volleys. The rivalry between Anglian Longbowmen and Szabadok horse archers is ever present on the battlefield, where both sides keep tallies of kill-count.